Independent 4WD tourists to Australia’s deserts prefer to ‘discover’ Aboriginal cultural experiences at destinations, rather than seeking them out beforehand. This is one of the key research findings of Doris Schmalleger, an Austrian post-graduate student who conducted interviews with travellers as part of the Desert Knowledge CRC’s On Track (TM) Desert 4WD Tourism research project. Dr Dean Carson, Research Fellow at Charles Darwin University and project leader said the research showed that enticing independent 4WD travellers was challenging because most did not seek information on Aboriginal cultural tours before their trip. ‘Instead, they prefer to explore the desert and its offerings and if an Aboriginal cultural product catches their attention they might participate,’ he said. 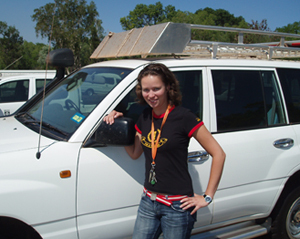 Doris Schmalleger conducted 30 in depth interviews with Australian and overseas 4WD travellers to central Australia. She found that while some travellers were willing to pay for ‘individual and profound’ cultural experiences like educational evening activities run by local people, many were reluctant to pay for the experience. ‘It reminds us that there are several desert 4WD tourism markets and a targeted approach to each for providing commercial products is more likely to bring success,’ Ms Schmalleger said.